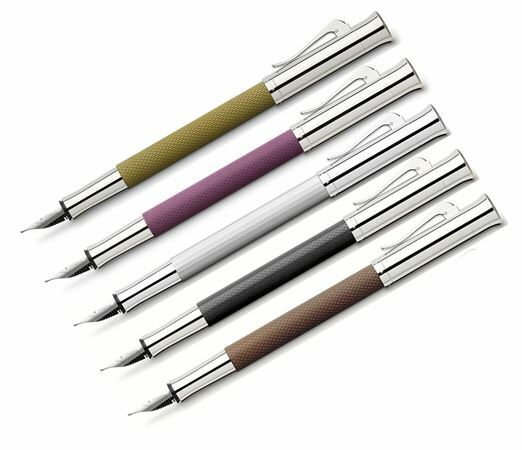 Order your Graf Von Faber-Castell Guilloche Fountain Pen today from FahrneysPens.com. Fine Pens, Refills & Luxurious Gifts – great prices & fast shipping. Don't let the graceful lines and elegant looks fool you – these German-made pens are built for precision and performance. The Graf von Faber-Castell Guilloche fountain pen has a unique design that distinguishes it from the ordinary. As the name implies, the finish is characterized with guilloche patterns etched into the colorful resin barrels. The fluted metal caps, curved, spring-loaded clips and tapered grips are silver-plated and coated with rhodium to prevent tarnishing. The Guilloche fountain pen has a superior, two-tone 18K gold nib. Matching instruments include the ballpen and 0.7mm pencil with twist mechanisms, and the capped rollerball.